In McMullin, the defendant homeowners (“Defendants”) constructed a retaining wall and other improvements upon approximately 6,000 square feet of an adjacent common area lot. 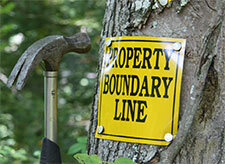 Because of the rural nature of the HOA, the trespass went undiscovered for several years. When it was discovered and the HOA’s demands to remove the unapproved improvements fell on deaf ears, the HOA sued the Defendants to quiet title to the disputed area, and to compel the removal of the improvements together with the restoration of the disputed area to its previous “native” condition—all at the Defendants’ expense. The HOA prevailed at trial and was awarded its attorney’s fees. The Defendants then appealed the trial court’s ruling. On appeal, the Defendants asserted three (3) primary arguments in support of their position: (1) that the HOA was equitably estopped from bringing its lawsuit, (2) that the Defendants had acquired ownership of the disputed area through adverse possession, and (3) that the trial court erred in granting an order compelling the removal of the unapproved improvements at the Defendants’ expense because the HOA should have instead been required to accept monetary damages as compensation in exchange for an equitable easement granted to the Defendants. Each of the arguments is addressed below. As the basis for their equitable estoppel claim, the Defendants cited the HOA’s earlier correspondence which informed the Defendants that the HOA Board decided not to pursue the unauthorized construction as a violation of the CC&Rs and instead instructed the Defendants to work with the HOA’s architect to develop a landscaping plan to screen the improvements from view. In reliance on this information, the Defendants asserted that they spent tens of thousands of dollars on the landscaping plan, and used that assertion to underlie the justification for their equitable estoppel claim. The Court of Appeal disagreed, and pointed out that any alleged “reliance” on that information from the HOA came well after the unapproved improvements were constructed. Additionally, the Defendants could not establish one of the essential elements of equitable estoppel because the HOA was unaware of the extent of the Defendants’ encroachment onto HOA common area at the time it decided not to pursue the matter as a CC&R violation. The fact that the Defendants continuously and deliberately concealed the true location of their rear property line when submitting for HOA approval also undercut the Defendants’ argument. Adverse possession is a legal doctrine that allows trespassers to become owners of the land that they wrongfully occupy. Although the name sounds distasteful (and the results can be), the trespasser is not necessarily acting with malicious intent. In some instances, the trespasser may have made a mistake by relying upon faulty deed information or property descriptions. In order to establish a claim for adverse possession in California, the Defendants must have shown all of the following: (1) that they possessed the disputed area under a claim of right or title; (2) that they actually, openly and notoriously occupied the disputed area in a manner that gave reasonable notice to the HOA; (3) their possession was adverse and hostile to the HOA; (4) they continually possessed and occupied the disputed area for five years; and (5) they paid all property taxes levied and assessed against the disputed area during that five-year period. The trial court found that the Defendants’ adverse possession claim failed because they did not pay any property taxes on the disputed area. The Defendants’ conceded this fact; however, they believed that an exception to this requirement was warranted based on a 2013 court decision that held payment of property taxes is not necessary in an adverse possession claim where the disputed property has no value (and thus, was exempt from property taxes). The Defendants asserted that the common area lot which was encroached upon had no value, and therefore no property taxes were levied against it. The Court of Appeal struck down this argument for numerous reasons. One of the primary reasons was because of the nature in which common area lots are valued and ultimately taxed. It is true that a HOA may not be issued property tax bills for specific common area lots. This does not mean, however, that common area lots have no value or that no taxes are paid for them. California Revenue and Taxation Code Section 2188.5 states that all parcels owned by individual owners within a HOA are assessed property taxes not only on the value of their separate lots, but also on the value of their proportionate share of all common areas owned by their HOA. In other words, the taxes associated with common area lots are assessed to, and paid by, each of the HOA’s property owners as part of their individual property tax bills. Accordingly, the taxes for the disputed area were paid in part by each of the HOA’s roughly 1,400 members—not solely by the Defendants. The Defendants therefore failed to meet their burden to show that they were not required to pay property taxes on the disputed property, and the trial court properly found that their adverse possession claim failed as a result. Finally, the Defendants argued that the trial court erred in granting the HOA a mandatory injunction that required the Defendants to remove the unapproved improvements and to restore the disputed area to its prior condition at the Defendants’ expense. The Defendants believed that the trial court could not grant the injunction without first finding that issuing monetary damages to the HOA in exchange for an equitable easement was an inadequate remedy from the HOA’s standpoint. A court has the discretion to grant an equitable easement to a trespasser by balancing the hardships to either party, and by finding several factors to be present. One of the primary factors is that it must be shown that the trespassers were innocent; that the encroachment was not willful or negligent. The Defendants were unable to satisfy this requirement because they knew where their actual rear property line was located, they intentionally did not identify it to the HOA, and they began construction knowing they did not have the necessary HOA approvals. All of the Defendants’ arguments were thus defeated and the Court of Appeal ultimately affirmed the trial court’s ruling. The Defendants were required to restore the disputed area to its prior condition, at their expense, as well as pay over $200,000 in attorney’s fees to the HOA. We really like this case, especially in light of its discussion of the adverse possession and equitable easement issues. Willful trespassers like the Defendants in McMullin often believe that begging for forgiveness rather than asking for permission is the best way to achieve their goals, especially after substantial sums of money have already been used to construct unapproved hardscape and landscape improvements. In those situations, equitable estoppel, adverse possession, and prescriptive/equitable easement theories are often asserted by the homeowner in order to make the HOA question its ability to ultimately prevail should a lawsuit be filed. The holding in McMullin gives HOAs new confidence in their ability to defeat such assertions and to make an encroaching homeowner second-guess his attempts to claim common area as his own.